Matte foundations are simply everything for anyone who wants to have flawless look. If you have oily skin and you want to get rid of the shine, the best resort is putting on these matte foundation. 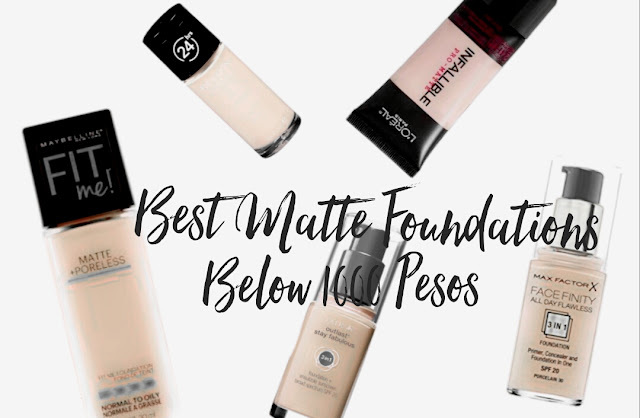 I have surveyed few beauty enthusiasts about the best matte foundations in town for below 1000 pesos and here's the list. Max Factor Facefinity 3in1 All Day Flawless Foundation (925 pesos). The coverage is a bomb. If you are looking for full coverage with powder finish, Max Factor's Facefinity 3in1 foundation is the best. Because it is a 3in1 Primer, Concealer, and Foundation, you can expect medium to full coverage. Revlon Colorstay Foundation (825 pesos). Formula is very lightweight and buildable. It really does stay on the skin for long hours. Good for combination to oily skin. L'Oreal Infallibe Pro-Matte Foundation (670 pesos). When it was launched in Manila sometime this year, beauty gurus raved how the L'Oreal Infallible Pro-Matte Foundation doesn't need retouch even after wearing it for 6 hours or more. It has an amazing oil-control feature and demi-matte finish that offers medium to full coverage. Maybelline Fit Me (399 pesos). Mid 2017 was the boom of Maybelline Fit Me and several beauty bloggers claimed it was a perfect FIT. It has light to medium coverage that has a light consistency but still buildable and easy to blend. It mattifies and lightens appearance of pores. Covergirl Outlast Stay Fabulous (795 pesos). You will surely get the coverage of a liquid foundation,powder, and concealer in one. It has a long lasting coverage to keep you flawless all day.